Finally, a little freedom! Day six was our first without any obligations or expectations and we were excited to get it and explore! We woke up early (for a vacation day) and we skipped a morning swim because our cab driving friend from yesterday (I’ll tell you his name. It’s Manuel.) was picking us up at 9:30 so that we could get to the Amway Center for an hour later. So, the game started at 10:30. AM. This was something new for the team and it was designed to allow school age children to come and check out the game. Two thousand of them. From schools all over the city. It was actually pretty cool and the kids were so funny. 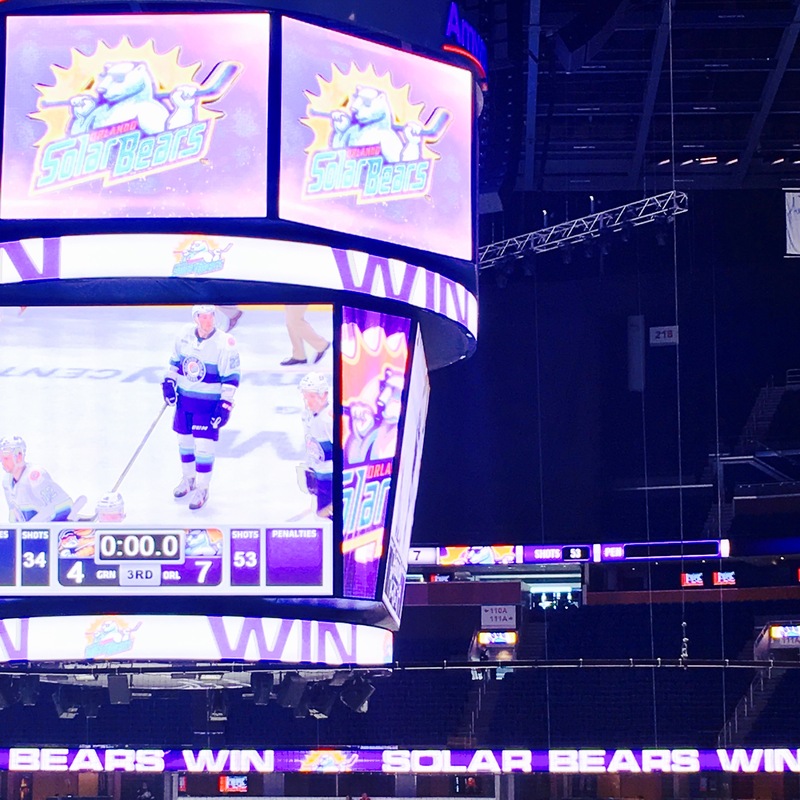 When they sang along with Sponge Bob Square Pants arena music, when they waved their rally towels every time the Solar Bears scored and, when they chanted, “go bears go” and when they sang their little hearts out to Let It Go on jumbotron karaoke. Adorable. From the moment we arrived, we were treated so wonderfully. A host came outside just to tell us about a secret entrance where we could avoid the big line-ups of kids. The woman at the box office was really patient and accommodating. Everyone made a point of saying hello to us and welcoming us to the arena. 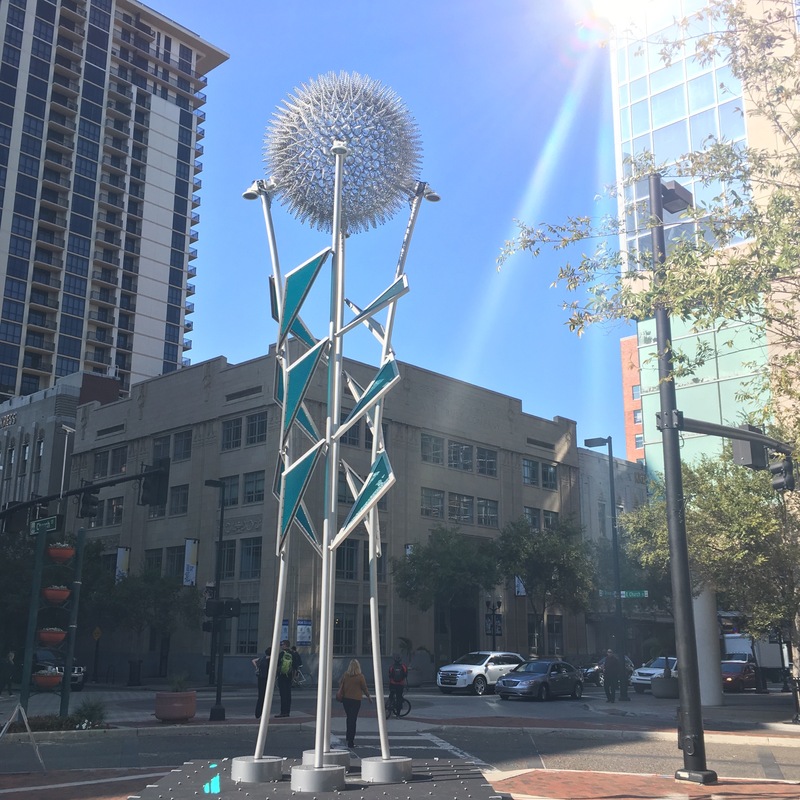 Orlando is a city of tourism. Everyone here is on top of their customer service game and, you know what? It’s really nice. 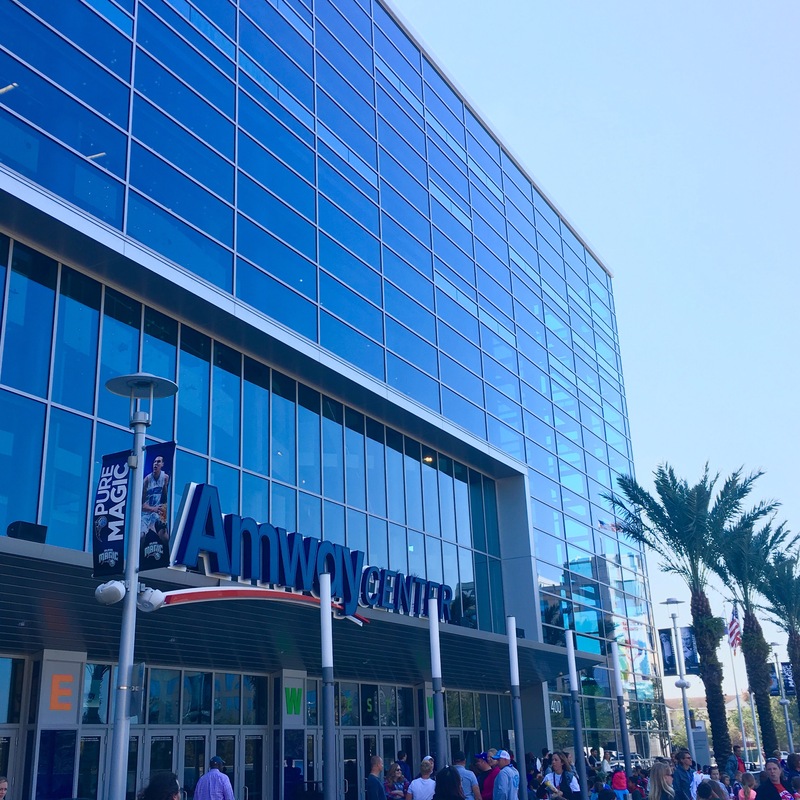 We did a loop or two of Amway Center, checked the place out and got to our seats just in time from puck drop. I was inspired to do a special ECHL edition of my “Our NHL experience” series so I won’t give away too many details, but I will say that we really enjoyed the game. 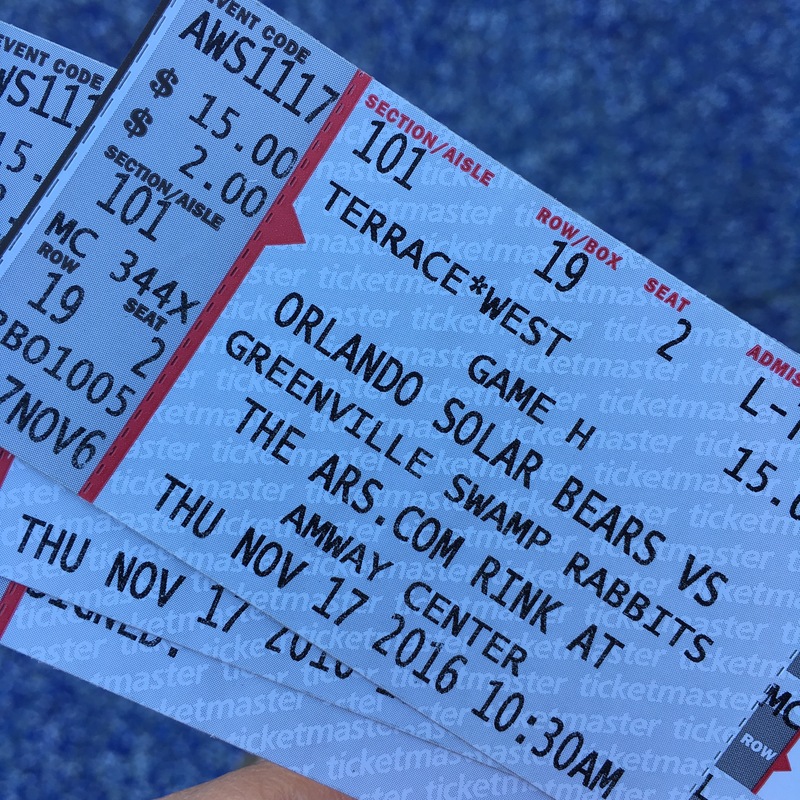 The action itself was exciting (3-1 Orlando after one period, 3-3 after two, 7-4 final) and the game day experience was really well done. Afterwards, we took a peek inside the Orlando Magic team store. They’re the roommates of the Solar Bears. We didn’t buy anything there, but I did try on a blazer that can only be described as snazzy. Manuel has shown us the way to walk to get to an area of that boasted restaurants, cafes and things to see so we headed in that direction. Downtown Orlando is quite pretty. It’s very clean and well-kept. There are trees at regular intervals and street art on most corners. The streets are brick and well-marked with big fancy signs. It felt largely like a business district, but it was peppered with enough eateries that it was also tourist friendly. It has a very southern feel to it. We were hungry and Manuel had recommended a pizza joint for us to try, but then, while looking it up on a map (thank you, Downtown Orlando free wifi! 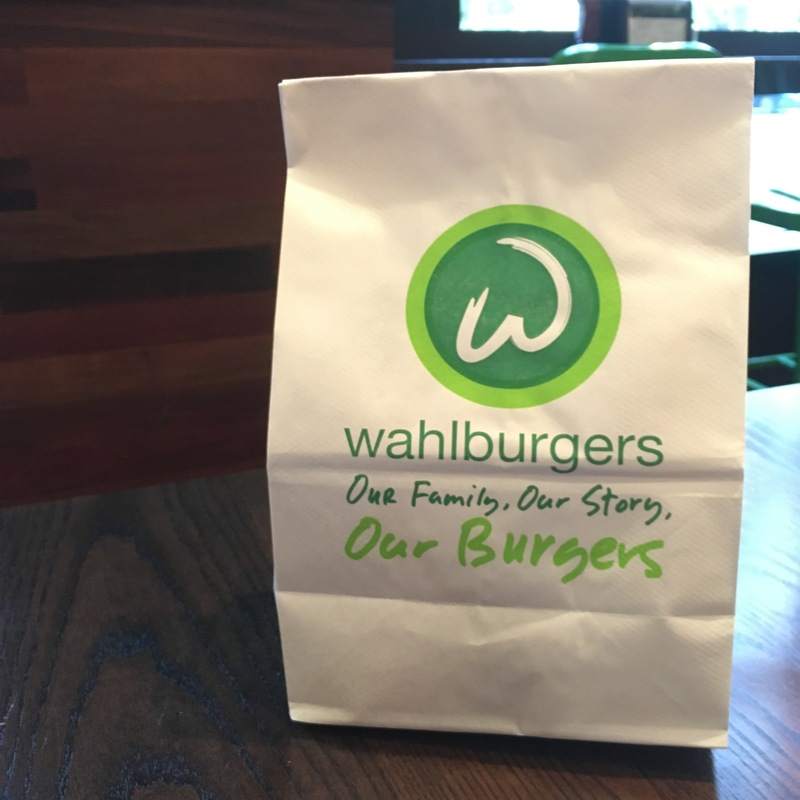 ), we discovered Wahlburgers was nearby. We’d watched the show (on hotel tv, of course) and we’d talked about going to one in Vegas with my brother, but we never made it. I loved the vibe of the restaurant as soon as we walked in. Everything was really dark wood with lime green chairs and accents. It looked really nice. We were greeted by a super friendly hostess who gave us the lay of the land and sat us at a table in the full-service section. I decided to try sweet tea and Kevin had water. I was a little surprised that the drinks came in paper cups, but /shrug. Once our server came and introduced himself, we ordered a portobello sandwich for me (“Ma’am, you’re aware there’s no meat on that?” Uh, yeah.) and an OFD for Kevin. Sides were onion rings for me and tater tots for him. When everything came, it was served in baskets and it was really, really good. The portobello sandwich was a little melty/drippy, but delicious. Kevin really enjoyed the OFD. 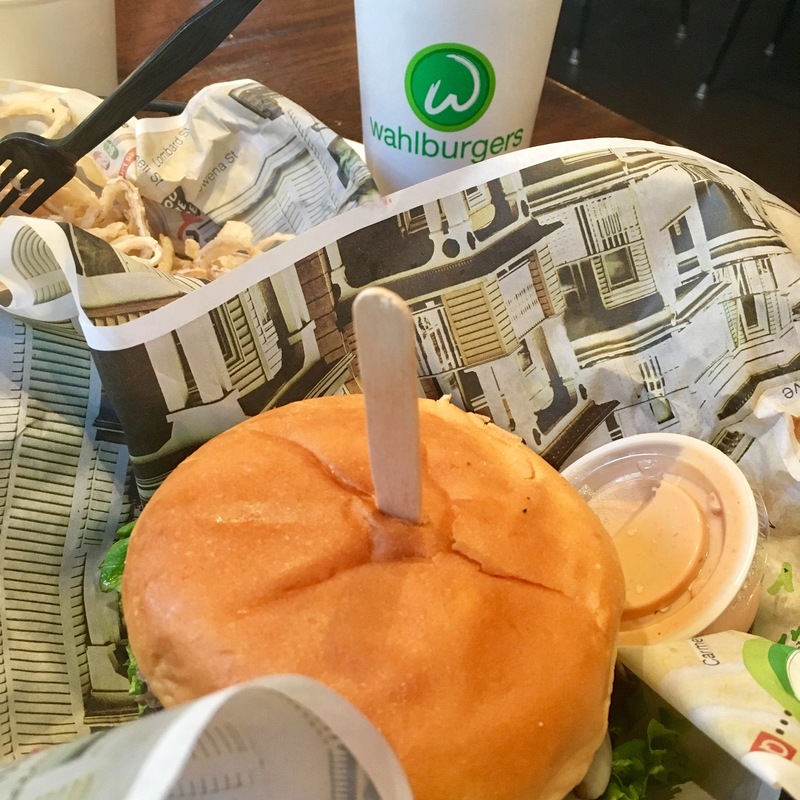 I wouldn’t get the onion rings again – they were super thin and didn’t taste much like onion at all – but overall, is give the place a big thumbs up. I would definitely visit if I was in another city where there was a location. As we were getting ready to leave, a couple of guys came in with WWE championship belts. Kevin has always really liked those so he noticed them right away. 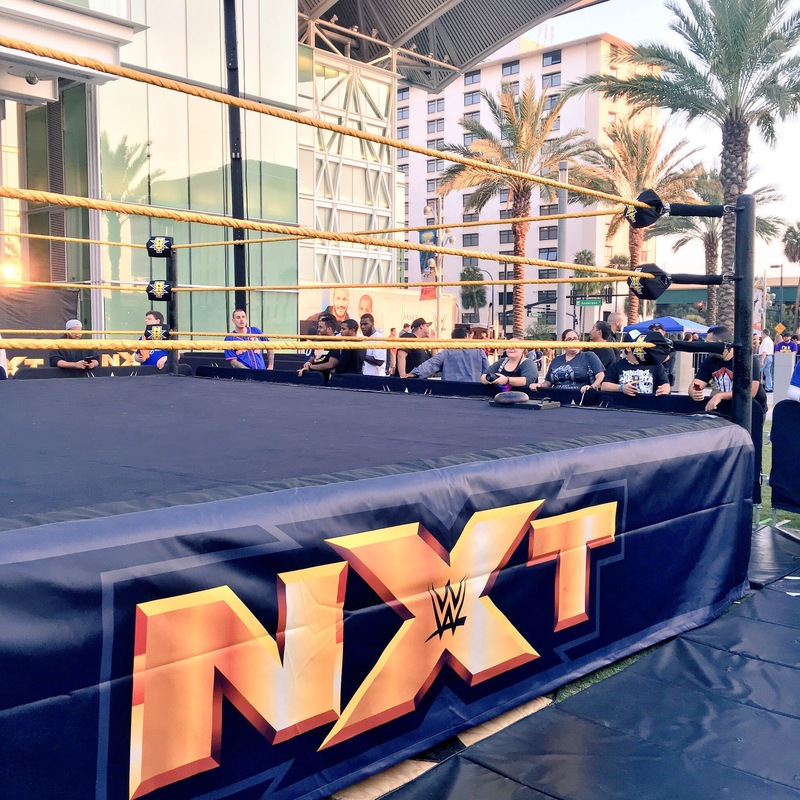 We overheard them talking about a WWE event that was happening because Wrestle Mania is being held here in Orlando next April and tickets went on sale (presale and in person sales only) that day. We walked away and didn’t think much more about it. We were deciding between staying downtown and looking around and going back to our hotel for an afternoon at the pool. We leaned towards going home, but I said I wanted to walk at least a little further. I stopped at a bank machine and then we turned a corner and saw some kind of event being set up on a lawn across the street. We carried on and as we got closer to the action, Kevin saw some WWE signage over at the Dr Phillips Centre so we crossed the street. It turns out that we’d just stumbled on the main event! 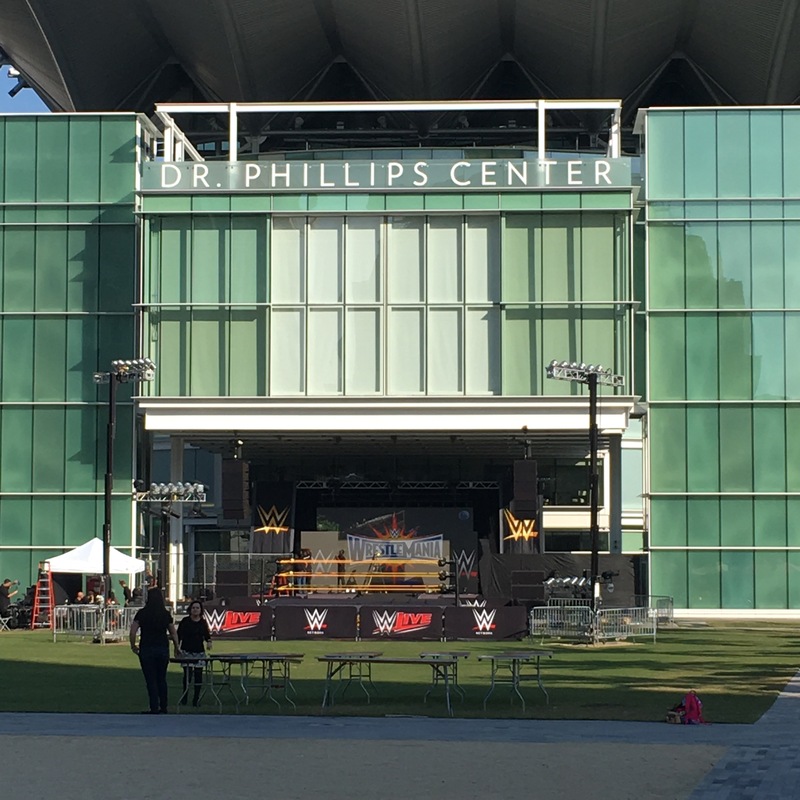 We asked a host who was working at the end of a long line of people and he said that everyone in his line was waiting to buy tickets to Wrestle Mania at 4pm, but there was “some kind of party” on the lawn starting at 5pm and that it was free. Sometimes it feels like Kevin and I just run into the most random events and the next thing we know, we’re in the middle of them. It’s actually one of my favourite things about our relationship, that we can make plans, but also break them when something like this happens. We decided to stick around and see what was going on with this party. We walked around to ththe front of the lawn (which was all cordoned off) mostly just to get a picture, but then we came across a line-up of people. This was just after 3pm. We got in line and waited until they let us into the party at 5pm. We watched food trucks arrive and tents get set up, we watched photo stations for people who wanted pics with the championship belt and a we saw the real wrestling ring and televisions set up at the far end of the space. The whole time, I just kept laughing. When is woken up that morning, I’d never expected I’d be attending a wrestling event! We got let in and went to the photo area so Kevin could get his pic with the belt. Next, we headed straight for the ring and ended up with spots right at ringside! We waited for another 40 minutes and then the hosts came out and introduced themselves. They showed some videos and then welcomed a few wrestlers (including Booker T!) out into the ring. Next up: the action! We stuck around for NXT matches, one men, one women and then we decided to explore the other tents and start heading home. We called Manuel and he was about 25 minutes away so we grabbed a couple of Kona Ices and walked around. We ran into Kevin’s friend from earlier in the day, Shades. 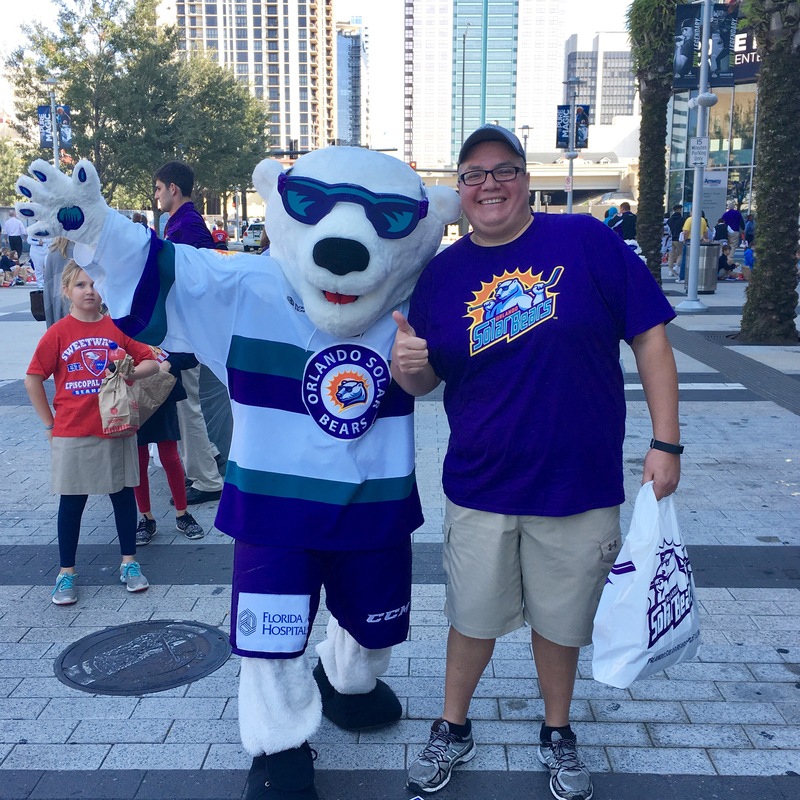 He’s the mascot for the Solar Bears and came running up and hugged Kevin like he was a long lost brother. It was awesome! By the time we made it back to Caribe Royale, it was 9pm. So much for our afternoon at the pool! We grabbed some food at the marketplace, headed to our room, relaxed, tried to figure out how we’d get everything back into our suitcase and prepared for our last day of vacation and a road trip out to the coast.